I found this great interview on nightclub.com - in which Jon Taffer is interviewed. He is the host and expert of Bar Rescue [if you are one bar industry professional who didn't watched few episodes - shame on you]. Jon Taffer could be called also "very opinionated" - right on my alley... however due to his brand involvement and definitely also his age, I do have often the feeling, that he is all the time a couple of steps behind real cutting edge trends and ideas. 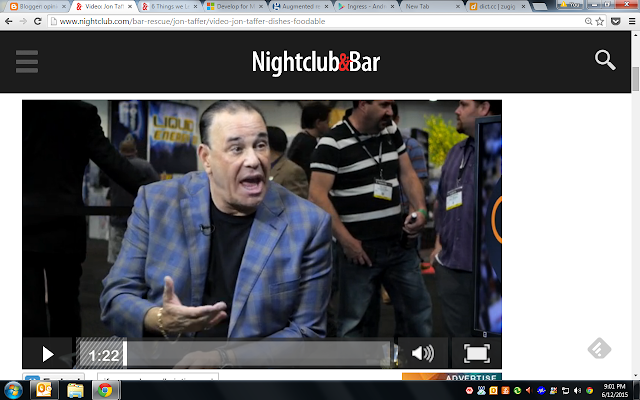 Yes - Taffer is definitely right, that this changed a lot. Is it a cutting edge trend though? Nope - we do have LED's already quite long, and there is not much more, which really caught mainstream, which is very innovative. Maybe the problem of this is: the price! B2B companies, which offering (sometime questionable) innovations to the bar industry thinks, that our industry is a cash cow - and charge accordingly. That though will lead to a very slow adoption rate. The innovation which I do see here is definitely on bar level, that long-lasting and energy-saving LED-Edison bulbs will become widespread. They very much look like an Edison light bulb, but don't have any of the disadvantages [but the price]. Even more creative lighting will be possible on "bulb-level"
first, the mentioned millennials are environmental conscious - and nobody can tell me, that a throwaway illuminated liquor bottle is great on a dump site! Second: there are few tasteful use of this technology [not one I can think off now]. Yes, he is right - there is a great trend to do virtual jukeboxes and similar application. Still, these steps are not bold and fast enough. This is a typical tech-critics argument - and I don't agree, that there is the risk at all. Technology is giving the bar / nightclub operator to make ordering more efficient and gives the staff more time to interact with the guest! Jon also didn't mentioned the opportunity of apps, which could enrich the experience of bars, can be used for efficient direct-marketing tool, can even improve social interaction of guests to guests. He might be right, that ordering technology is a two sided sword - however again, it depends on the specific type of venue. Later he is underlining the success of fast casual outlets, and this technology is perfectly suited towards these type of outlets! Success of fast casuals and the "struggles" of fast food companies. This has very little to do with the bar industry, but he pictures a completely distorted picture. Sometimes you cannot just focus on growth - you have to also look at overall size of a company and revenue. Yeah - McDonald's sales are stagnating- and other fast food companies' financial trends are also no more set "on optimistic growth"- but what is the volume of McDonald's? I guess MickyD alone produces more revenue, than all fast casual changes together? McD's revenue in 2014 was 27.44 billion US. This is $27,440,000,000.00!!! Chipotle, by far the biggest and most successful fast casual chain, did in 2014 4,11 billion revenue. Yes - Jon is right, when it comes to trends. But we are talking about the an high12 to low13 figure industry compared to a low10 figure industry - go figure! Taffer is right, that Fast Casual didn't really tapped into the beverage sales. Is there an opportunity? Not sure... as fast casual is closer to fast food, than to casual dining, it might never really happen. I don't agree, that most big brands are innovative. It seems that their accountants analyse the market, and only approve products, when the trend already proofed, that this product category will be successful. And usually these big producers still cut corners, when it comes to sheer quality [as they have cost and consistency far more in their focus as niche producers]. Flavored whiskey? First of all, most products are liqueurs and cannot even be called whisk(e)y at all! Second - innovation is sometimes dangerous for the core expertise and overall reputation. Yes flavored products brings people to whiskey, but then if the palate mature, they certainly stay not with the brands. Basically it is a very shortsighted move of the liquor companies, to make the fast buck - but they will harm their customer base for premium products in the future. Further it shows in different other markets [rum, tequila] that flavored products are not exactly grow consistently. Obviously they grow strong in the early times of the trend, just because there is low supply. But later on the curve flattens fast. Apps, apps, apps: the adaption of using mobile apps in our industry is almost non existent - and if companies are using apps, it is very conservative. There is a huge opportunity. Location services [again apps]: There are already apps out, which are adapting location API's - however we as service industry supposed to spearhead these developments! This is the direct marketing tool of the future! Augmented reality [more apps]: the revitalized trend of augmented reality was shown by the 2015 Microsoft Keynote, where they presented their HoloLens - this was the next "logical" step of products like GoogleGlass and similar products. However augmented reality can be used without clunky headware already with our smartphones. It could give our guests the opportunity to "browse" our liquor shelves and check out the stories of brands... can give amazing insights of stories of our bars and can even connect to others. Facial recognition: I believe this is one of the biggest opportunities in hospitality. Luxury hotel brands know, that calling a guest by name, is the holy grail of customer engagement - still we are struggling with our limitations of our brain [except of those, who have a photographic memory - which are considerable less in our industry...]. Technology could help us - and I prospect, that the first hospitality company, which successfully integrate this technology, will rule the market in the next decade! Connectivity and internet of things: We all know, how difficult it can be, to have a bar full of individuals - some people, think, that the light is too bright, at the same time, some people, complain that the tables are too area is too dim, some complain, that the music is too loud, some do, that the music is not loud enough, some say, that it is too warm, some say, that it is too drafty. "the internet of things" could change that with an app. Think, that the bar operator could set things into certain limits, but the guests can change the variables within these limits. This off course need a completely new venue infrastructure [depending on how far the venue goes]. But it has immense opportunity! New amenities - I am often surprised, that hospitality didn't adapted yet to the current "basic" needs of our guests. Let's face it, most of our guests have a smartphone - and a smartphone runs out of battery in no time. Having a armchair or table with a built in USB port to charge seems logical - a table could even include a simple mobile holder - which would make also a bit space on the table.